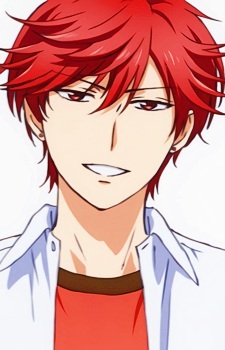 Mikoto Mikoshiba also known as Mikorin, is one of Nozaki's assistants and Yuu Kashima's best friend and classmate. Mikoto attracts the attention of many girls, and is admired by the males as well. However in reality, he has a timid and "tsundere" attitude. While outwardly he flirts with girls shamelessly and confidently, afterwards, he cringes and becomes embarrassed beyond words at his own actions. It is discovered that his personality is actually the inspiration for Nozaki's heroine character. Mikoto has no drawing skills when it comes to characters or single objects, but he is skilled at drawing flowers, effects and accessories to bring out the charm in characters. Mikorin likes gentle, modest, and innocent types of girls but most of those kind of girls are too intimidated by him. He lives with his dad, his mom, and his cat. Mikorin is good in Biology and English class, but doesn't do as well in Government class. Mikorin likes to eat hamburgers and does not like peppers and bitter things. In a deleted Tweet, his voice actor, Nobuhiko Okamoto, mentioned that Mikorin uses horse shampoo to wash his hair.